The ECG Pocket Reference offers healthcare professionals an interactive and enjoyable way to hone their skills in ECG interpretation. 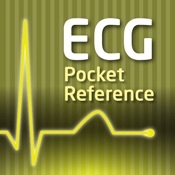 Developed in association with the internationally respected clinician and educator Professor A John Camm (St George’s Hospital, London, UK), the print version of the ECG Pocket Reference has made it into the hands of 50,000 European healthcare professionals to date. This brand new app allows the same valuable educational benefits to be gained via the convenience of the iPhone.